Hey Love: In The Mix! Happy Monday Babes! Hope y'all had a great weekend! Mine was spent having a blast with my family! I finally got to hang out with my little brother after not seeing him for two months---so it was a lot of catching up and planning his next move since he's graduating in December. Tons of decisions to make, for sure! super chic look and love that print mixing! Super cute! Love all the prints. Such a cute outfit, love the hat! Super cute girl! Love the mixed prints! love this outfit! the stripes and floral is perfect! Cute outfit! Love the pattern mixing and the hat! Super, super cute! You mixed these perfectly! I don't know why I am so dang afraid of putting together patterns because everyone I know rocks them! The hat is also darling. Too cute. Love how stripes seem to go with everything. That hat is adorable. I'm wearing an almost identical outfit today--but I love your skirt so much more! Adorable! you pull off the hat so well! Such a cute outfit. The hat really adds a fun appeal, and really looks so good on you! What a playful outfit! Love it. You look so adorable! Love love that hat and mix of prints. Adorable! glad you had a great weekend! i love your outfit. it's a really cute mix. that floral is awesome. Such a cute outfit girl. Adorable outfit! 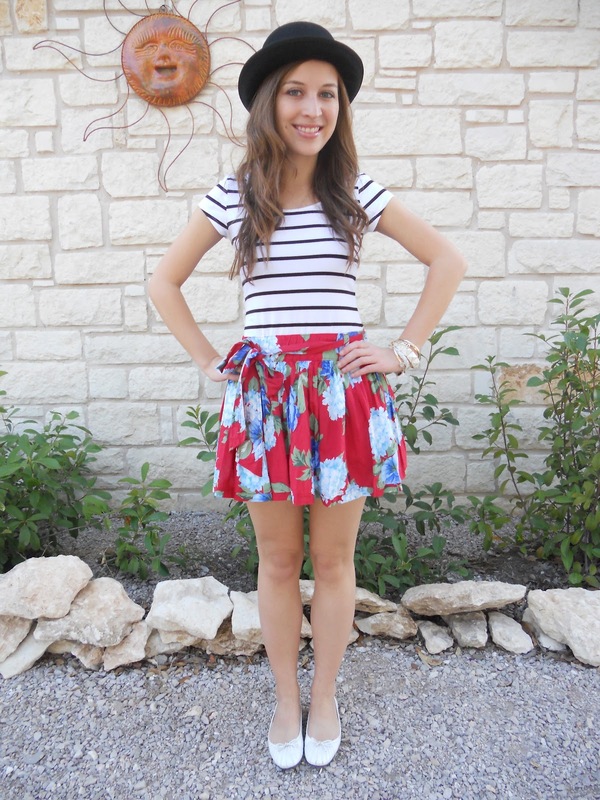 I love the mix of stripes and floral, and that hat is so cute! adorable outfit!! i think i have the same skirt haha! glad you got to spend some time with your brother... time with loved ones is so priceless. Your floral skirt is so adorable. I love how your paired it with a stripe top. Love the contrast between the two! Weekends with family are always fun. 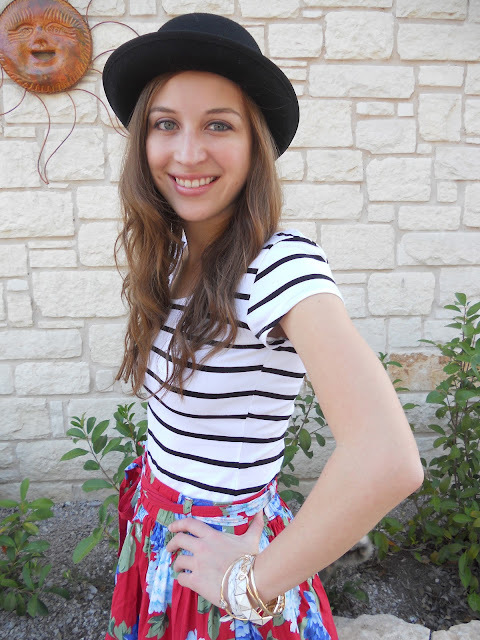 This is such a cute look--stripes and florals together is one of my favorite combinations! Cute cute cute!!! Love the color combo and pattern mixing. You totally pull this off! AWESOME LOOK! Your skirt is so perfect, matched with your hat. I love it from head to toe! keep posting cute looks. cute stripes and floral!!! Love this look! I like your blog, you have a great style, love it ! Love this outfit,the skirt is so pretty. Love love love the pattern mixing - you look SO cute! I really adore how you combined floral and stripes. so cute! You rock that hat! I also like how you used the dress as a top, and did it so well! I love this outfit...especially the hat!